If I have the dough to spend, to be honest, I wouldn’t go for a DIY electric car. I would rather buy an electric vehicle (EV) from a manufacturer off the lot of a dealership. Well, most of us are broke, and high gasoline prices are ripping a hole in our pockets. That’s why we are hoping a DIY electric car can help us to reduce of monthly expenses. If you don’t have the money, you can’t demand a lot from your EV. What we want is for the homemade electric car to meet our very minimum requirements. Let’s take speed as an example. If you don’t have the money, you can’t drive very fast on your EV. You may have to use a smaller electric motor and a less powerful controller. You may have to be contented driving at “old man” speed in your EV. Forget about buying new parts and components. Your option right now is either used or refurbished parts. You can save a lot of money if you were to spend the time sourcing for used parts. Doing so, you may have to take a longer time to complete your EV project. 3) Selling leftovers from donor car. Think of what you can sell from your donor car. If the internal combustion engine (ICE) is still in good condition, sell it for some cash. Do the same with other redundant components such as gasoline tank, radiator, fuel lines, exhaust pipe etc. Well, the above are 4 ways I can think of on how to reduce the cost of a DIY electric car project. If you have more to add, feel free to write your thoughts in the comment section below. 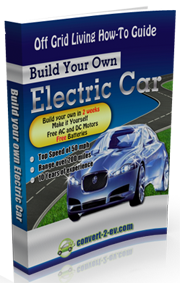 Do you want to know how to convert a conventional automobile into a plug-in electric vehicle? If you do, check out the Convert2EV e-book from Les Oke. Les and his family have been living a green lifestyle in Canada for from than 15 years. To reduce carbon footprint, Les drives around in a DIY electric car. The Convert2EV manual is Les’ experience completing numerous electric car conversion projects. For more information, click on the link below. ==> Click here to visit Convert2EV now!